It's time to strut your stuff! The fame that comes from strutting your stuff on the catwalks of Paris, Milan, or New York is fleeting, but becoming a Zi Collection model is the stuff Paparazzi legends are made of. Think you have what it takes to rock the runway? This fall, eight lucky Consultants will get to claim their corner of the catwalk as they kick off the hottest Paparazzi party of the year: ONE Life. As the music thumps, the cameras flash, and the crowd screams, each model will take their turn in the spotlight, decked out in bling as they debut the highly coveted 2019 Zi Collection Signature Series. Not only will our Zi Collection models be the very first to get their hands on these iconic accessories, their moment in the spotlight will be immortalized as each one is adorned in a necklace from the collection that has been lovingly named after them by the Paparazzi stylists! When the 2018 Zi Collection is released to the masses this fall, these Paparazzi powerhouses will become household names. With their names on everyone’s lips, we’ll have just have one question for them: can we get your autograph? Beginning February 1st, the top two point earners each month through May 31st will be crowned as our 2018 Zi Collection models. * There are many ways to earn points, so work it! •	2 points for every 10 PV – including online customer orders! Start practicing that signature strut and get ready to flaunt it! It’s time to access your inner rock star and claim your corner of the catwalk! 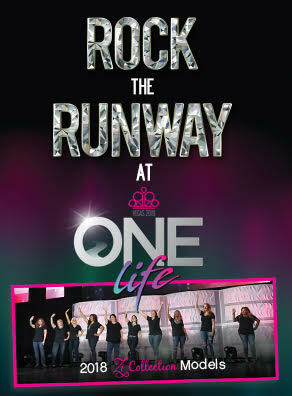 To see the regularly updated Leaders’ Board, check out the ‘Rock the Runway’ page on the ONE Life website, PaparazziConvention.com. *Consultants who have achieved a Lifetime Rank of Executive Producer (or above) prior to February 1, 2019 will not be eligible. Additionally, those who have been honored by having a Zi Collection piece named after them in prior years will not be eligible for the 2019 competition. Have you ever had a bad day, only for it to be completely turned around after something good happened to you? Perhaps the person in front of you paid for your drink, offered you an unexpected compliment, or just gave you a simple smile? This kind gesture, no matter how small, most certainly changed your outlook and offered a boost of confidence, if even for a moment. Did you ever think of the ripple effect that small act of kindness had as you carried it with you? Give away at least one piece of Paparazzi jewelry per day. This could be to a co-worker, a cashier, your hair stylist, a teacher, a nurse… the possibilities are endless! After you have given a piece away, snap a selfie with your index finger raised, showing that you are ONE who chooses to make the world sparkle a little brighter. Post your selfie on Facebook, Instagram, and/or Twitter using the hashtag: #betheONE. It will be up to your discretion to share what your selfie means in the caption. Remember, this is about doing a kind deed, not necessarily sharing about it. We will select a random winner each day to receive a $25 Back Office credit. Then, on May 1st, one lucky winner will receive our GRAND PRIZE! You have ONE Life to carve your name on the hearts of those around you, and to make a mark on the world that can’t be erased. You have ONE Life to leave your legacy. You have ONE Life to make a difference. You have ONE life to change the world $5 at a time. You have ONE Life to make the world a better place. 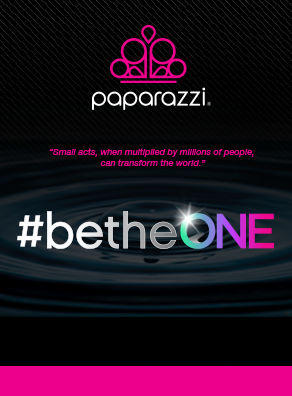 #betheONE and join us in changing the world by paying it forward with Paparazzi!